A sale is a sale but a part of me always felt a little less excited when it came from a friend or family member. I appreciated their support but desperately wanted the validation of having customers who purchased because they loved my handbags, not because they loved me. We all start our businesses to make money and nothing is more frustrating than having sales sporadically trickle in, despite our best efforts. And when those sales are coming from friends and family, the number of people we can sell to is limited. Low sales don’t just apply to new businesses either. I can’t tell you how many messages I’ve read from Etsy sellers who have seen their sales drop by half and are trying to get them back up by frantically making changes and paying for ads. Craft show vendors are having a harder time making sales as the events get bigger and more competitive in their category. And with site builders like Shopify and Squarespace making it easier than ever to build a website, more and more are showing up each day, making that coveted first page of Google harder to reach. But a saturated market is no excuse for low sales. Every industry has competition and if restaurant owners threw in the towel because someone else was selling burgers, we wouldn’t have thousands of burger joints to choose from. It doesn’t matter the category you sell under or the type of product you make; everyone has the ability to bring in consistent sales. So why’s everyone struggling to make sales?! But chances are, it’s not one piece of the puzzle that’s not working. It’s lots of little problems that add up to one big problem: no sales. There isn’t a lack of advice or opinions when it comes to what a small business must do to be successful. We’re all looking for a magic bullet but the truth is, the successful businesses aren’t doing anything out of the ordinary; they simply have their ducks in a row and work strategically. Taking a handmade business from making a few sales each month to a full-time venture requires more information than can be provided in an article. But check in with the steps below to see how your business stacks up and download the full ebook if you need more guidance. Consider the way consumers shop through different sales channels. People shop online when they’re looking for a specific or hard to find item. No one’s opening Google and searching “lip balm”, paying $5 to ship the $2 item and waiting a week for it to arrive when they have chapped lips today. People visit craft shows to discover local makers and if they buy, it tends to be impulse items; not too expensive, easy to carry and gives instant gratification. When people have an item in mind (e.g. a top) but aren’t sure of the details (e.g. whether they want long sleeved, printed, etc.) they tend to head to stores where they can browse a selection of products. Different sales channels attract different shoppers who buy different products. If you fill your online shop with the same items you place on your craft show table, you may be missing out on sales. That’s why each sales channel must be assessed individually and one channel must be managed and bringing in consistent sales before adding more. Etsy shop broke? Let’s fix it before you set up on three other handmade marketplaces and rack up membership, listing, or advertising fees. A sales channel will affect all areas of your business from people you attract and the products they buy to when they shop and where they come from. Examine all the sales channels you can sell through, select the best options and then choose one to overhaul and boost sales. The full ebook has 184 pages and can be purchased on its own for $29.99. There is also a 72 page workbook. The workbook and ebook (256 pages) can be purchased together for $34.99. I’ll send you Chapter 2, which has 30 pages packed with information that can change your business on its own. You don’t choose an outfit before you know where you’re going. You don’t plan a route before you know the destination. And you shouldn’t make a product before you know who it’s for. 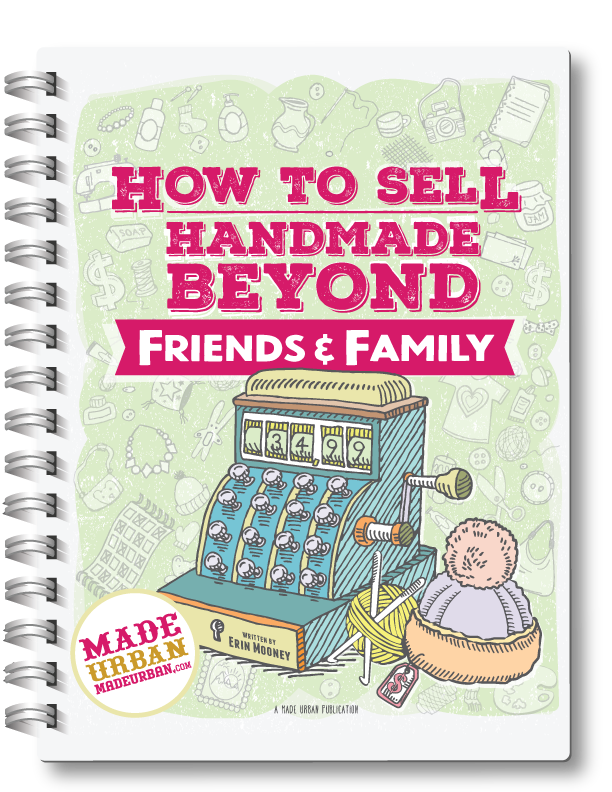 Too many handmade business owners make then search for a customer instead of finding a Facebook group, magazine, blog or store where people are already gathering and designing a product perfect for them. Everyone could be a customer but the fact of the matter is: even the biggest companies in the world don’t sell to everyone. With millions of advertising dollars, website visitors and customers, they still have a target market they serve and a big chunk of the population they ignore. Your target market will eliminate who you don’t (or don’t want to) serve and reveal who’s better suited to buy your products. Your niche market will define which segment of your target market is best suited for your products and examine their needs and wants. Your ideal customer will define who’s the perfect fit for your product and start to shape the look, voice and personality of your brand. A lot of business owners start with their ideal customer and don’t define a target or niche market first. This tends to result in a fantasy customer who doesn’t fit into a larger group of people and is difficult to find out in the real world. There’s one key element that should be defined if you want your products to be found outside of your sales and marketing channels: a passion or a problem. If you can find a topic your audience is interested in that’s related to your products, but not involving them, you open so many new opportunities to market and sell. Think about it; when you set out to achieve a new goal, let’s say eating healthier, do you immediately go on the hunt for products to buy or do you Google “how to eat healthier”, “healthy meal plans”, “healthy diets”, etc.? And while reading, if you happen to come across a product that will help you achieve the goal you’re reading about, you’re more likely to pay attention to it and buy. Find a passion or problem people want to discuss, learn or ask questions about in groups, forums, at events, in magazines, etc. and determine how you can tweak your product to appeal to that passion or problem. Now you can explore the products you make and match their features to the needs and wants of your niche market. You can also alter your product, based on the sales channel you want to sell them through. First, you must define “what” you sell by narrowing down your category and subcategories. Next, you can add “who” into the mix to create a niche product that serves your niche market’s pain points, passions or preferences. Then you can build collections to create an impact, convey a message and offer options that appeal to the different needs and wants of your ideal customer. Following this process ensures you’re not just making for the sake of making. I get it, creating is the fun part. But your products must have a clear direction and purpose, as well as fit into the bigger picture of your business. What do you want your business to be known for? How do you serve the needs and wants of your niche market? Curious if you’re offering too much variation? Would the same customer be interested in all of your products? Does at least one product feature stay consistent across all products? Do all of your products have a common theme? If you answer “no” to the majority of these questions, you’re likely offering too much variation for a handmade business. Your products must have a clear cohesive theme and appeal to a specific customer. Otherwise, you’re sending shoppers mixed messages, not offering enough selection when they find an item they love and perhaps coming across as unprofessional. You can’t be everything to everyone. You must find a niche, stick within it and become known as THE vendor for a specific type of product. Have you thought about why your business exists and why shoppers should choose your products over a competitor’s? If you closed your doors tomorrow, would your customers feel a loss or could they buy something similar from another vendor? The brands I’m most loyal to and the products I spend the most money on give me a reason to choose them again and again. They offer something no one else is…does your business do that? It’s not always about the product; sometimes it’s the way they run their business. They may have great customer service, a fun brand or offer a perk I can’t get anywhere else. Anyone can come along and start making the same product as you. But if you add individuality to each layer of your business, you build something only you can provide. I have a simple formula for finding your unique selling position. And once you know what it is, you must communicate it to shoppers. It goes beyond a tagline or elevator pitch, I have a full checklist for all the areas you should be communicating your unique selling position and instructions on how to infuse it into your brand. What would you pay more for: a piece of cake served on a paper plate in a rundown diner with plastic chairs and tables, or one served in a cake boutique with white and gold décor, luxurious tufted booths, crisp white tablecloths and shining silverware. Which business would you be more likely to remember, tell friends about and visit again? The cake boutique that charges more and sells more can do so because of their branding. Can you sell handmade without a brand? Yes. Will you be able to sell more handmade at a higher price and gain loyal customers who come back to buy again with a brand? Absolutely. Unfortunately, many handmade businesses don’t build a brand or take the first step to define one. If you want to boost sales and profits, don’t skip branding. Use the Touchpoint Checklist to discover over 30 areas of your business that should be branded. If you want to boost sales today, marketing should’ve began weeks ago. You need a marketing plan and that marketing plan must involve more than one step. Have you heard the theory that it takes at least seven touches before a potential customer is ready to buy? Whether or not that stat is accurate is up for debate but one thing’s for sure: marketing is not a one-and-done task. You can’t expect someone to see your post on Facebook, click on an ad or pick up your postcard and be ready to buy. Getting people to your sales channel is half the battle. Once they’re there, you need a system in place that gives options beyond buy or don’t buy. Without that system, potential customers just fall through the cracks. Does your business have funnels set up? What about a newsletter and blog? Automated emails? All extremely important to ensure you reach those seven interactions with a customer and each is an integral part of system that continuously attracts shoppers, ensures you don’t lose them on their path to buying and retains them for future sales. Unfortunately, your business is not on a continuous upward climb. Every company goes through peaks and valleys based on their customer’s spending habits throughout the day, week, month and year. You must recognize the rhythms of your business and plan product launches, marketing and selling accordingly. If your customer is a mom of three who doesn’t have time to go online until after the kids are in bed, posting product photos to Facebook at 8 am is likely ineffective. If jewelry sales ramp up in February but it’s January 31st and you haven’t thought about Valentine’s day products, gift sets, marketing campaigns, etc., you’re bound to miss out on sales. Determining “when” will help organize your schedule, get a step ahead and be more effective with your product planning, marketing and selling. Raise your hand if you’ve suddenly felt lost after finishing a book or completing a course that seemed so promising? The ideas inside got you excited and motivated but that quickly faded once there were no more pages to turn or videos to watch. A lot of us know what’s right but knowing is not the problem; it’s doing. We’re aware of what’s best to eat but if we don’t have a plan or healthy recipes and ingredients on hand, nine times out of ten, we divert back to what’s easiest and most satisfying, short-term (and that’s a bowl of macaroni and cheese for me;) Each section has worksheets designed to be filled out as you go to build a plan once completed, which will help you take action. If you feel stuck or are wondering what to work on, pull out those worksheets! I’m Erin, founder and one of the creative minds behind MadeUrban.com. I’ve been in the crafting industry over a decade now, with 2005 being the year of my very first craft fair. I started as the poster child for “craft fair don’ts” and grew into a successful handmade business owner selling full time through craft fairs, online and wholesale accounts. That small business led me to my current dream career of helping others with their creative businesses and working for the cuddliest boss in the world…..my cat Josh.